This cell phone picture does not do justice to this great late-night New Years meal. 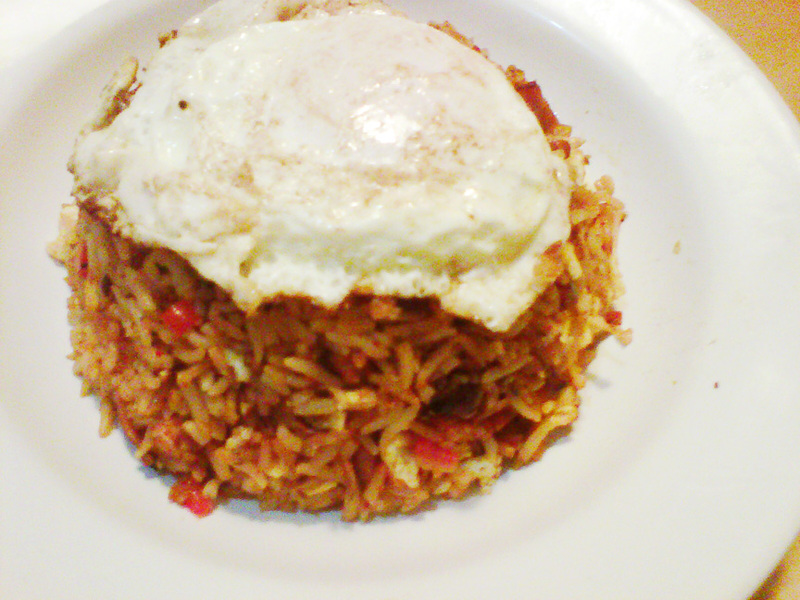 I welcomed 2013 with kimchee fried rice, a good luck breakfast that’s especially good after a night of New Year celebration. Kimchee fried rice should have the distinct flavors and verisimilitude of life in every bite—the good, the bad, the sweet, the sour, the salty and the savory. This classic simple dish represents frugal wisdom. Here is a little tip, the rice must be at least a day old; at which point the moisture has moved to center of each grain leaving the outer surface a little dry to the touch. If the rice has clumped, wet your hands and crumble the rice slightly. You do want a few lumps. Make some today. Add a little oil to the pan as needed pan. Scramble one egg, cut into small pieces and set aside. Fry one egg and set aside. Stir fry the red onion, bell pepper, garlic and ham until the onions have softened slightly then set aside. In a small bowl mix Korean chili paste (gochuchang), soy sauce, sugar and vinegar together. Crumble rice into the pan and salt lightly. Sear it for three minutes by tamping the rice into the pan with a spatula. Break into smaller pieces, add all ingredients except for fried egg and kimchee and stir fry until everything is mixed well. Add kimchee and stir fry for one minute. Pack fried rice into a small bowl and allow to rest for a minute. Flip bowl over onto a plate and top with fried egg, scallions and toasted sesame seeds. There you have it, Kimchee fried rice. Hi Antonio - Thanks for recommending a pan with Teflon® nonstick coating for your New Year Fried Rice recipe. I represent DuPont and it's always a pleasure to see people recommending our products.